On a balmy evening last summer, I joined a group of editors at Sakara's headquarters in NYC to get a first look at Mara Hoffman's new activewear collection, by way of a yoga session led by esteemed yogini Elena Brower. The scene was perfect: a grid of bright, feather-patterned mats spread across the airy loft space, with vegan treats and rose-infused water awaiting us on the side. As we took our places in front of Brower, I saw the sun setting through the window and marveled about the fact that I couldn't really ask for a better way to end a chaotic day at the office. That Zen feeling quickly dissolved when I stretched back into downward dog: My hands and feet slipped out from under me, cartoon banana peel-style, and I face-planted. I'm not the most accomplished yogi, but I'm typically able to tackle the average sun salutation without operational failure. But in this case, I took comfort when I glanced around and saw many other flailing limbs—and a few expressions of slightly astonished embarrassment that mirrored my own. "Oh yes, these mats are a little different," said Brower serenely, explaining that the slippery surface wasn't actually a design flaw. Created in collaboration with Yoga Design Lab, these mats don't just boast gorgeous patterns, but a truly unique texture. "Most people want mats with a lot of grip, but they don't realize they're getting less of a workout," explained Brower. Much of the athleticism of yoga involves using your core to maintain balance, and a grippy surface can be a little bit of a crutch. The Yoga Design Lab mats, however, force you to rely on that core strength in order to stay upright and prevent yourself from slipping. But here's where it gets really cool: Brower then took her water bottle and poured a few drops at either end of the mat, roughly where our hands and feet typically land during a sun salutation. When the moisture makes contact with the mat, it absorbs and actually makes it easier to grip—so you can essentially customize how much traction you want. Still, as much as I prefer a tough, sweaty flow class to easy stretching, I couldn't help but wonder if I'd find the slipperiness to be too much of a nuisance. I'm all for a more effective workout, but would yoga be as much fun and meditative for me if I was focusing all my attention on simply not falling? The answer is yes—and really, it's all thanks to Brower's water trick. It's been several months since I first took the mat home, and I lug it with me everywhere. That's saying a lot, since in spite of my own collection of yoga mats, I've always shelled out the $1 or $2 to rent one at a studio; I've always found them superior to the ones I have at home. Of all the factors of a great yoga session—the teacher, the atmosphere, the flow—you'd hardly expect the mat to play much of a contributing role. But on those mornings when I want to take a tough class to the next level, I keep the mat dry—and goodness, planks are hard when you're trying to keep every inch of your body stable. Post-class soreness has taken on a whole new meaning, but my muscle tone has also gotten a nice boost in turn. And if I'm looking for a little more support for say, tree pose? My water bottle is right there. 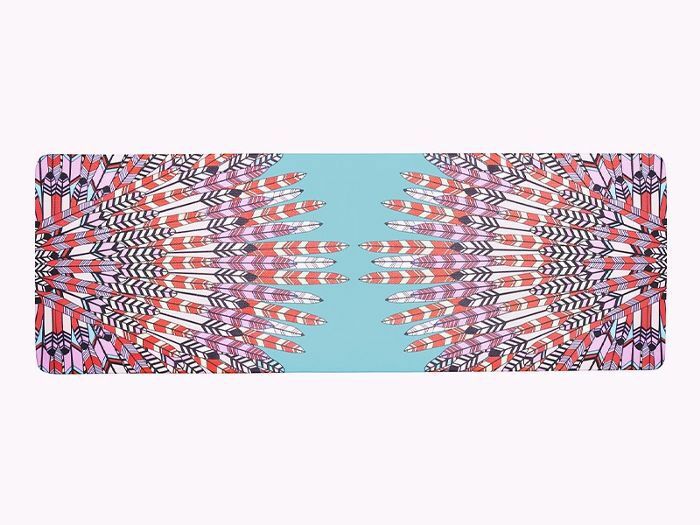 But just in case you need anything else to set this mat apart, there's always Hoffman's kaleidoscopic, Instagram-ready design. What do you think of the Mara Hoffman mat? Any other designs at Yoga Design Lab catching your eye? Tell us in the comments below!